↑ 1.0 1.1 1.2 1.3 Kandel, Eric R.; Schwartz, James H.; Jessell, Thomas M.; Siegelbaum, Steven A.; Hudspeth, A.J. (2013). Principles of Neural Science Fifth Edition. United State of America: McGraw-Hill. p. 622-626. ISBN 978-0-07-139011-8. ↑ Gross, C. G. (2008). 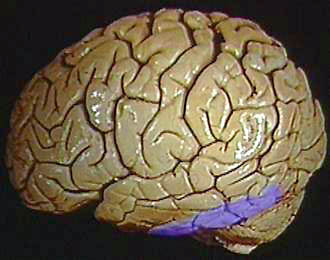 "Inferior temporal cortex". Scholarpedia (3 (12) :7294). ↑ 10.0 10.1 Gross, C. G. (2007). "Single Neuron Studies of Inferior Temporal Cortex". Neuropsychologia. doi:10.1016/j.neuropsychologia.2007.11.009. ↑ Dragoi, Valentin. "Chapter 15: Visual Processing: Cortical Pathways". สืบค้นเมื่อ 12 November 2013. ↑ Gross, Charles. 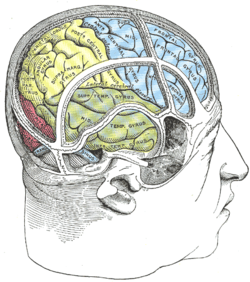 "Inferior temporal cortex". สืบค้นเมื่อ 12 November 2013. ↑ Spiridon, M., Fischl, B., & Kanwisher, N. (2006) . Location and spatial profile of category-specific regions in human extrastriate cortex. Human Brain Mapping , 27, 77-89. ↑ Nakayama, Ken. "Prosopagnosia Research". The President and Fellows of Harvard College. สืบค้นเมื่อ 9 November 2013. ↑ Gross, Charles (29 January 1992). "Representation of Visual Stimuli in Inferior Temporal Cortex" (PDF). Philosophical Transactions: Biological Sciences. Processing the Facial Image. 335 (1273): 3–10. สืบค้นเมื่อ 9 November 2013. ↑ Meadows, J.C. (1974). "The anatomical basis of prosopagnosia" (PDF). Journal of Neurology, Neurosurgery, and Psychiatry. 37: 489–501. สืบค้นเมื่อ 10 November 2013. หน้านี้แก้ไขล่าสุดเมื่อวันที่ 22 มิถุนายน 2557 เวลา 23:38 น.